When the Concordia Orchestra’s first notes ring out in Memorial Auditorium this Homecoming Saturday, there will be a new director behind the baton. 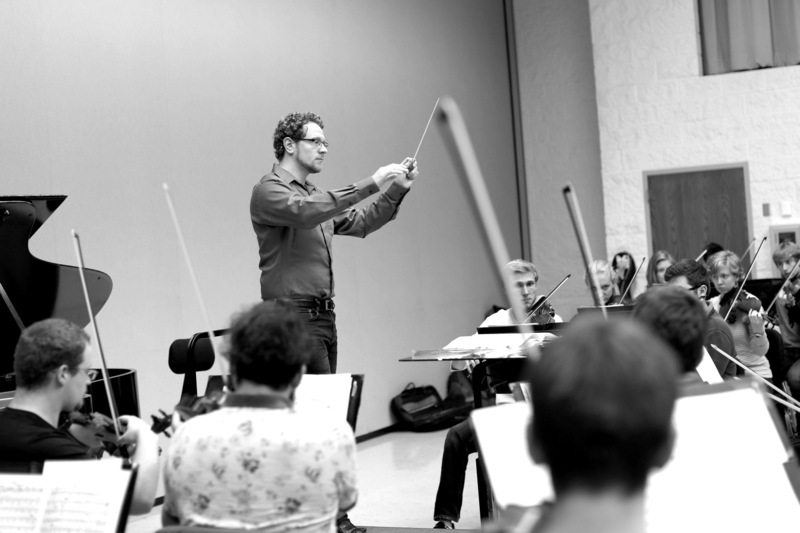 This year’s Homecoming Concert will mark the directorial debut of Kevin Sütterlin, Concordia’s new director of orchestral activities and conductor of the school’s flagship orchestra. Sütterlin succeeds Foster Beyers, who announced his resignation in February. While Sütterlin has been at the school for only a few weeks, his warm personality and hearty laugh have made themselves known within the walls of Hvidsten Hall of Music; so, too, have his ambitious plans for the future of the program. “I want to stir things up,” Sütterlin said. A passionate advocate for 21st century musicianship, Sütterlin believes in reimagining classical music in modern ways and breaking down the wall between audience and performer. Sütterlin’s experience with music began at a very young age. His father was a singer, and Sütterlin spent his childhood in the small German town of Radolfzell, singing in choirs, experimenting with a variety of instruments and playing the keyboard for an accordion orchestra. He went on to obtain his Bachelor of Arts in Music in instrumental conducting, with secondary majors in voice and piano, from Lucerne University of Applied Sciences and Arts – Conservatory of Music in Lucerne, Switzerland. But Sütterlin’s foray into 21st century musicianship really began during his time at the University of Memphis, where he received his Master of Music in orchestral conducting and, as a doctoral graduate assistant, served as the chief assistant conductor of the symphony orchestra, acting music director of the chamber orchestra and acting music director of opera. In 2014, he and his best friend cofounded Sinfonietta Memphis, an ensemble which focused on taking Viennese classical music – Mozart, Haydn, Brahms, Schubert – and presenting it in a new light. The group did outreach programs in Memphis’ lesser-privileged communities, held free concerts and offered free lessons to children who picked up lessons in school. They played concerts in unorthodox settings, such as a sandwich shop, where their music and their mission could reach a broader audience. “You reach people who would never come to a concert,” Sütterlin. When Concordia sent out the call for a new orchestra director last spring, Sütterlin saw it as the perfect opportunity to continue the work he had began in Memphis. He was particularly taken by the school’s liberal arts approach, as well as the size and quality of its musical ensembles. Sütterlin underwent an extensive application process, which required him to send in a cover letter, a repertoire list, and videos of him conducting rehearsals and performances. The search committee, composed of Concordia faculty from both within and beyond the music department, invited him to campus for an interview. He spent three full days at Concordia, participating in interviews with everyone from students to President Craft. He taught a music history class and a conducting class, and led a full orchestra rehearsal. Associate professor of clarinet Dr. Leigh Wakefield, who led the search, said that the committee was immediately impressed by Sütterlin. “He had an open personality, a warm personality, and a keen passion for music that showed both in conversation and in teaching,” he said. The students were impressed, too. Ben Ehrmantraut, a senior instrumental performance major and the president of the Concordia Orchestra, helped organize Sütterlin’s visit to campus. Sütterlin seems to have settled in well to his new position, despite the learning curve. While the Homecoming Concert will remain true to its traditional format, he hopes to stir things up later in the year by offering more time for composition and conducting students to work with the orchestra, performing in nontraditional venues, and finding ways to collaborate with other departments and community organizations. “That’s probably the most beautiful thing about music, that we can bring people together, let them understand each other,” Sütterlin said. And to students, he says, the door to is new office in Hvidsten 140 is always open.